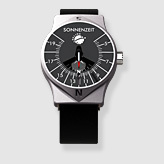 Portable sundial, sun compass and navigator. For all latitudes, also southern hemisphere. Glossy parts palladium plated. The equinoctial ring sundial originates from the "Golden Age" of sundials between the 16th and 18th century. It was also called the "Queen of Sundials", because it is the only sundial which can find due south without a compass and can be used at any latitude all over the world. The CIELO [ital. 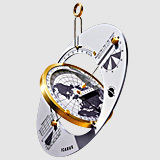 heaven] represents the highest level of development in the equinoctial ring sundial (registered for patent), is simpler to use and more accurate. And it is a model of the firmament, which helps us to understand the origins of time measurement from an authentically cosmic point of view. Glossy parts coated with palladium or gold, meridian disc and date ring made of stainless steel, all scales and time ring made of anodized aluminium with scratch-resistant printing. Detailed English manual (see documents). The CIELO was presented to the president of Ghana, John Dramani Mahama, by Angela Merkel as a welcome gift during his state visit to Germany in January 2015. The first consumer opinion: "It is more than a great piece. It is like a jewel!"